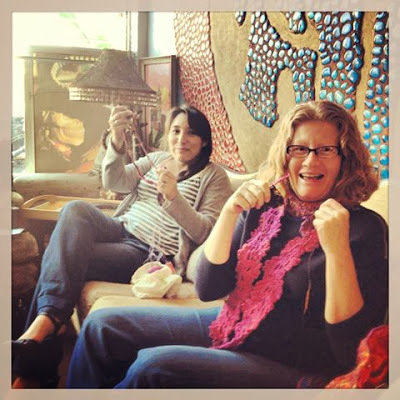 On Sunday afternoon I joined my crochet buddies at the Blu Elefant Cafe in West Adams for a couple of hours of yarny pursuits. We were sitting on the couches near the windows for about an hour, when more people than usual starting entering the Cafe. Turns out, the West Adams Heritage Association was having an open-mic mixer on Sunday from 2-4. Yes, it was a throwback Sunday that reminded me of my days sitting around various coffee houses of my youth while knitting, sipping and listening to folk musicians sing their original tunes. This group of residents from WAHA are a particularly preservation-minded group. A few people looked familiar to me from recent L.A. Conservancy gatherings. Everyone came over and asked about our knit group. People were talking about renovations to their historic homes in the area. A few WAHA residents got up and entertained the group. It was a delightful afternoon with community-minded folks! 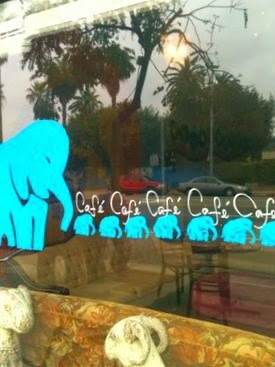 Join us on the third Sunday of every month from 1-3 pm at the Blu Elefant Cafe, 2024 West Washington Blvd., L.A.